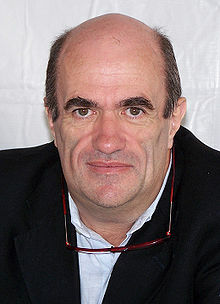 The first book I’ve read of the Man Booker longlist is Colm Toibin’s The Testament of Mary. 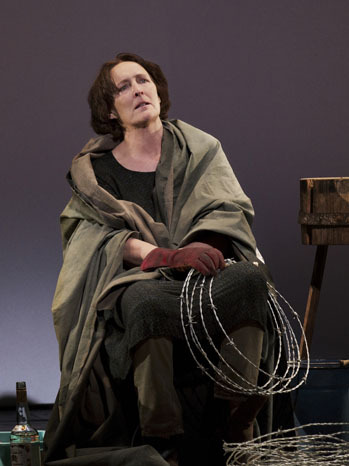 This short book has been performed as a monologue by Fiona Shaw, and has caused a considerable amount of controversy for “attacking” Mary. Any book that deals with faith and takes an unusual stance is bound to attract attention, but Toibin is an author who knows what he is doing: this is no “attack” but a literary approach to a figure who he sees as historical rather than mythical. In Christianity, Mary holds a sacred place as the mother of God, and as such she is often seen as a figure of pure womanhood rather than as a person in her own right. Toibin’s dramatic novel gives Mary her own voice and her own story. The Testament of the title is an indication of Mary’s legacy, in her own words, but of course echoes the biblical Testaments, and indeed the language of the novel also echoes the simplicity of words of the Bible in modern translations. The story is told by Mary, as an old woman nearing the end of her turbulent life. She describes her life as it is, with followers of Jesus (whom she cannot bring herself to name) visiting her, asking her questions and trying to secure a version of the truth. Yet what constitutes truth is a tricky issue which resides at the heart of the novel: Mary is determined to tell her truth, but her truth does not coincide with what others believe. Mary, it becomes clear, does not believe that her son was the Son of God, but rather that he was misled, in with the wrong crowd (she describes the disciples as ‘misfits’), and too charismatic for his own good. (It is difficult, here, not to think of The Life of Brian and the line “He’s not the Messiah, he’s a very naughty boy”!) The torments she suffered, therefore, through the persecution and eventual crucifixion of her son, were all the more excruciating for their pointlessness, to her, and her description of her son’s death is moving and rather difficult to read for its painfulness. Throughout, she speaks in a mother’s voice, full of concern and sadness for her son’s path and ultimately agonised by its outcome. Toibin describes himself as a “collapsed Catholic”, and the struggles he has with faith are manifested here. Though Mary rejects the beliefs of her son’s followers, she understands the importance of faith, attending both the synagogue and the temple and finding some comfort in them. And while she rejects the miracles, such as the raising of Lazarus and the water turned into wine, as well as Christ’s rising from the dead, she describes them in detail and offers no explanation. Such things are, after all, a matter of faith – and Mary has none. This is cleverly done, I think: Toibin makes it clear that this is not the biblical Mary, but one who has doubts and disbelief, but she does not try to convince the reader by explaining away the signs of divinity, and to have done so would have been heavy-handed. Instead, Mary simply presents what she saw, alongside her views, and admits she has no explanation. It sometimes seems as though she is trying not to believe in her son’s divinity against all odds. The Testament of Mary focuses very much on the real and the physical, an unusual attribute for a book about Mary. Even the nature of the virgin birth (which is not mentioned here) lifts her into the realm of the metaphysical and the ethereal, but this Mary is very much real, presenting us with her aging self, though combined with more abstruse concepts; she tells us early on that “Memory fills my body as much as blood and bones.” This framework of the real, filled in with less tangible and more complex issues of faith and doubt, memory and reality, pain and suffering, creates a believable character with a pleasing corporeality – there is some emphasis in the novel on tears, breath, bones, blood which conjures a living person. From that point of view, one could even read this as feminist: a demythologising of an iconic female figure, brought to life in her own testament and given her own voice for once. This is a novel which many will find difficult, particularly from a Christian point of view, but ultimately it neither confirms nor rejects anything: it may be controversial, but it is literature, which should be controversial. One doesn’t have to agree, or even like it, but it is a riveting read and recreates Mary as a literary character, whilst raising some interesting questions about faith and doubt.